Priscilla begins by telling us that we have an enemy. An enemy who is dead set on destroying all you hold dear. He does it calculatedly, to disrupt your life and discredit your faith, to keep you from experiencing the abundant life Christ has for you. He targets your heart, your home, your mind and your life. We are in a battle but the battle began long before God created us. It is not a losing battle. God determined the ultimate winner of the battle. 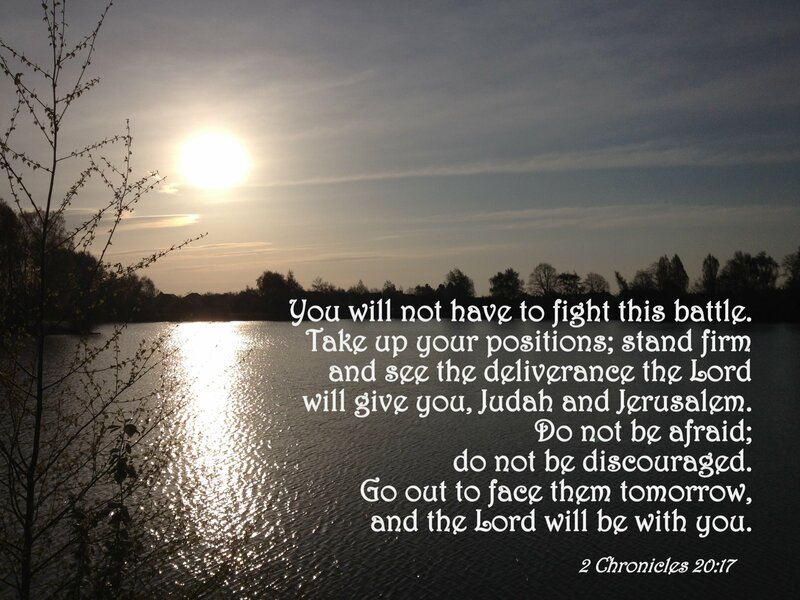 The struggles we endure can be so much lighter if we will take our struggles to the Lord. He created prayer. He wants us to communicate with Him and prayer is the way we are to do it. He wants us to draw near to Him and to Trust Him. 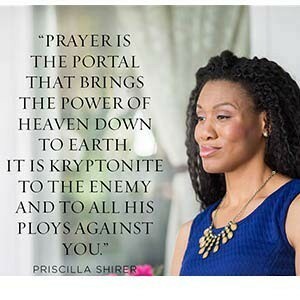 The enemy flees when we go to the Lord in prayer. The enemy hates that! The enemy wants you to feel defeated and to feel that it is hopeless to go to God. If you feel defeated and don’t communicate with the Father. Satan wins! Priscilla starts the chapters of this book off with the statement ‘If I were your enemy’ and then she talks about things the enemy would do to defeat you. This kind of threw me at first having her say ‘if I were the enemy’….don’t know why, it just did. The truth is you have to think about what his strategies are and be able to recognize them when the attack hits. Strategy 1 – Against Your Passion. Get it Back when It’s Gone: He seeks to dim your whole desire for prayer, dull your interest in spriitual things, and downplay the potency of your most strategic weapons. (Eph. 6:10-10). Prayer comes from passion for a God who can change things. Strategy 2 – Against Your Focus. Fight the Real Enemy: He disguises himself and manipulates your perspective so you end up focusing on the wrong culprit, directing your weapons at the wrong enemy. (2 Cor.11:14). Satan is prowling and doesn’t want you to be faithful in prayer. Strategy 3 – Against Your Identity. Remember Who You Are. He magnifies your insecurities, leading you to doubt what God says about you and to disregard what He’s give you. (Eph. 1:17-19). You are a child of God and He loves to hear from you. Strategy 4 – Against Your Family. Fortify the Lives of those Around You. He wants to disintegrate your family, dividing your home, rendering it chaotic, restless, and unfruitful. (Gen. 3:1-7) Prayer makes all the difference in the lives of those who you love. Strategy 5 – Against Your Confidence. End the Reign of Guilt, Shame, and Regret. He constantly reminds you of your past mistakes and choices, hoping to convince you that you’re under God’s judgment rather than under the blood. (Rev. 12:10) Your past doesn’t define you or disqualify you from approaching your loving Father in prayer. Strategy 6 – Against Your Calling. Confront Your Worries and Claim Your Calling. He amplifies fear, worry, and anxiety until they are the loudestvoices in your head, causing you to deem the adventure of following God too risky to attempt. (Josh. 14:8) Admit your fear, Go to the Father, confess your fear and ask Him to take it away. He tells us 365 times in His Word, ‘Do Not Fear’. He is there for you. Take it to Him. Strategy 7 – Against Your Purity – Staying Strong in Your Most Susceptible Places. He tries to tempt you toward certain sins, convincing you that you can tolerate them without risking consequence, knowing that they will only wedge distance between you and God. (Isa. 59:1-2) Prayers that have power come from a person in pursuit of righteous living. Stay strong and rely on God. Strategy 8 – Against Your Rest and Contentment. Reclaiming Peace, Rest and Contentment. He hopes to overload your life and schedule, pressuring you to constantly push beyond your limits, never feeling permission to say no. (Deut. 5:15) Not everything is a God thing. All this busyness is not necessarily from God. 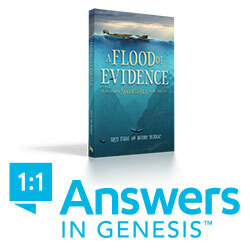 Just because it is geared toward your children or the church, doesn’t mean it is something you must ‘do’. You must take time for God and rest to find your Peace and Contentment. Let others do some of those ‘things’. You don’t have to ‘do’ it all. Spend time in prayer and quiet with the Father. Strategy 9 – Against Your Heart. Your Hurts. Turning Bitterness to Forgiveness. He uses every opportunity to keep old wounds fresh in mind, knowing that anger and hurt and bitterness and unforgivenss will continue to roll the damage forward (Heb. 12:15) Forgive no matter how you feel. Forgive because God did it for us. He gave His Son for us. Satan doesn’t want us to forgive. He wants us to stay tangled up in his deceptive web and spend time stewing over past hurts. Give it up. Give it to God. And move on. Do not let Satan have his way. Strategy 10 – Against Your Relationships. Uniting in a Common Cause. He creates disruption and disunity within your circle of friends and within the shared community of the body of Christ. (1 Tim. 2:8) Satan hates it when God’s people unite and form a strong front against which he cannot penetrate. His Word tells us not to depart from gathering together and worshipping, praying, and communing with each other. We are stronger together. It is when we venture off and don’t go to worship or Bible Study or Church get togethers that we venture away from the Father. Stay strong and keep united with the body of Christ. Praying God’s Word is powerful. 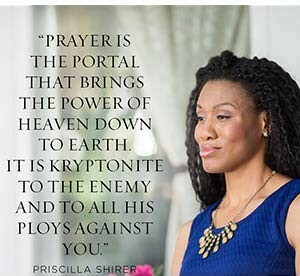 Priscilla gives us several Scriptures at the end of each Chapter (Strategy) to pray. They are quoted in the chapter not just the addresses so you can pray them right then. Or you can keep the book nearby during your quiet time and pray them then. There are a number of other authors who teach us to pray God’s Word back to Him. I think the key to this is to remind US of HIS Word and to show HIM that know it and we believe it. It also reminds us of His promises to us. 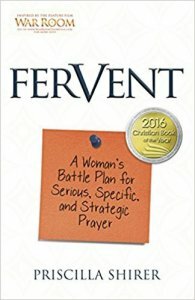 The Cambridge Dictionary says fervent means a) (USA) Showing Strong and sincere feelings or beliefs, and b) (UK) used to describe beliefs that are strong and sinerely felt or people who have strong and sincere beliefs. What the Word tells us and what Priscilla is telling us in this book, is to live a righteous life, and pray with enthusiasm and faith, believing God’s promises and your prayers will be heard and answered. I highly recommend this book. It is addressed to women primarily but hey! Guys can certainly learn from this book as well. I give it 5* rating. It reminded me of all the doubts the enemy places in our minds and how to quickly derail them by staying fervently in touch with our heavenly Father. I suggest you buy it and get to reading it asap. The sooner the better. To Buy Now, the book is available at Amazon and also at Christianbook.com. Note: If you purchase from one of our links we may receive a small commission. Please see our Affiliate Disclosure. Please leave comments below about this Review. We very much appreciate your feedback. Please note that by leaving your comments you authorize us to capture your info and store it on our site in the event we need to reply to you. Your info will not be shared with any third parties. ‹ A Highway of Holiness – What is it?